Preliminary attack (developed in Passcape Software) is quite effective against short, simple, dictionary, repetitive, keyboard, etc. passwords and consists of several mini-attacks. Each mini-attack can be enabled/disabled individually. Common brute-force attack. Performs several simple brute-force attacks based on predefined character sets. Simple dictionary attack. Fast check the password by verifying all words from a given dictionary. Extended dictionary attack. It's almost the same as above but with some smart mutation options set on. Attack on repeatable symbols. Checking passwords as a repeatable sequence of a character. Eg. '1111111' or 'xxxxxxx'. Attack on simple patterns, like '123456' or 'qwerty'. Attack on complex patterns. The same as above, for compound patterns. 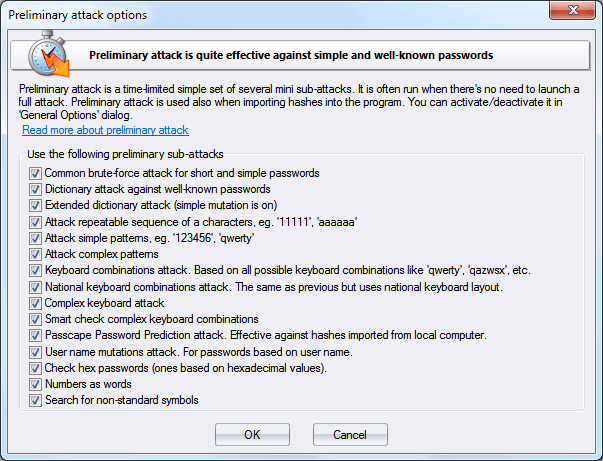 Keyboard attack checks for keyboard passwords and all possible combinations. Eg. 'qwer', 'qazwsx', 'asdzxc', etc. National keyboard attack. The same as above, but checks passwords typed in national keyboard layout. Complex keyboard attack is the same as the previous 2 attacks, for compound keyboard patterns. Attack on hex passwords (eg. 7A49F3). Attack passwords based on numeric words. Search for short passwords that were created using non-standard UNICODE characters.